Author Marie Kondo gained a global cult-like following with “The Life-Changing Magic of Tidying Up.” The catharsis felt by her followers indicates just how cluttered many of our professional and personal lives have become. A similar phenomenon has swept through the corporate sustainability world. 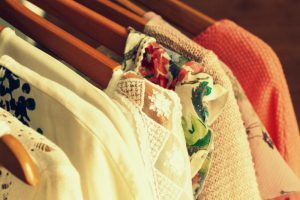 If you’re looking to clear out your corporate sustainability closet, read on for some tips on de-cluttering. The concept of materiality is simple: focus on what matters. The fact that this simple and somewhat obvious concept has been integrated into sustainability action plans with Kondo-like enthusiasm speaks volumes about the prior state of many corporate sustainability programs. Sustainability efforts were somewhat scattered and there was little guidance on how to prioritize or focus. A materiality assessment is the qualitative de-cluttering of your hot topics and initiatives. How did sustainability get into such a state? For many years, organizations struggled to make sense of sustainability and were reactive to the latest research or to the day’s headlines. A change in global dynamics led companies to face new concepts of sustainability and social responsibility, yet most had little idea how to address these emerging issues and business risks. As a result, responding to the voice of stakeholders became the modus operandi. Gradually, the number of topics voiced by stakeholders grew, so more things were added to our plates – but nothing was removed. 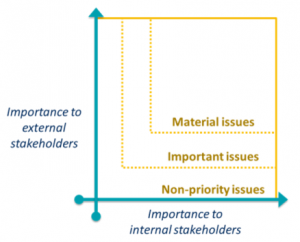 A materiality assessment is a key starting point for re-aligning the corporate sustainability agenda and allows us to weed out the many smaller or outdated concerns. Moreover, a materiality assessment renews our focus on a shorter list of topics that really matter to our business today. It’s essentially a spring cleaning of our priority list. Many companies stop there. The danger in not going further is that a materiality assessment can identify or even fix symptoms without fully addressing a potential underlying problem: the lack of a clear set of goals and a meaningful strategy. See our case study to learn how Farmer Bros used a materiality assessment for this purpose. If a materiality assessment provides a compass, a full corporate footprint is our map. The development of full value-chain footprinting, or Scope 3, has given us the ability to provide clarity about how our corporations are affecting the world and where the best opportunities are to do more good, and less bad. For many companies, this can mean putting more effort into improving supply chains or the use of their products. Leading companies have made significant improvements using this metrics-based approach for decision making. By understanding where the hot-spots are across the full value chain, the decision of where to invest time and resources takes on clarity and purpose. The Scope 3 Evaluator, developed by GHG Protocol and Quantis, provides a good tool to get started. Scope 3 footprinting is not only about greenhouse gas emissions. At Quantis, we’re working with leading companies to take the same approach to address many other issues, such as water footprint, land availability, and many more. One example is with Kraft Foods. Roger Zellner, the company’s Sustainability Director for Research, Development & Quality says, “Having the ‘big picture’ of our total footprint — from farm to fork — validates the focus of our sustainability efforts”. A full corporate footprint is as powerful a tool to a sustainability manager as financial results are to a CEO. A business manager would never consider running an organization without those metrics. What metrics are needed for a science-based sustainability strategy? The roadmap of hot-spots provided by a corporate footprint is a perfect way to drive understanding and action on the few key issues that remain after your closet-cleaning materiality work. Jon Dettling, Quantis’ expert on driving sustainable change with materiality assessments and full corporate footprints, can help you determine the metrics-based approach adapted to your sustainability goals. You can also check out our article “5 Ways to Untap the Value of your Corporate Footprint“. Let’s de-clutter and focus on what matters.